“Of all the reasons that provoke violence against journalists, the most important one is impunity, it is the lack of investigation into the acts of violence and assassinations of journalists,” said Frank La Rue, UNESCO assistant director-general for communication and information, in a video commemorating the International Day to End Impunity for Crimes Against Journalists, which takes place every Nov. 2. “Every time that an act of violence is left without an investigation, without finding the culprits, without prosecution, and without punishment, it is an invitation not for one more case, but for many more cases to occur. So the first step to guarantee safety of journalists is to eliminate impunity of the acts of violence, and this is what we are trying to commemorate with the anniversary of November 2nd," La Rue added. Since the event was established by the United Nations (UN) in 2013, UNESCO has led the commemoration of this day each Nov. 2 to urge states to “implement definitive measures countering the present culture of impunity,” according to the UN. However, the figures concerning impunity are more worrying. Of the 827 cases, UNESCO has only received information about 402 cases from the States. Of these, only 63 have been resolved, representing 16 percent of the cases for which they received information and 8 percent of all recorded. In Latin America and the Caribbean, UNESCO recorded 20 of the 63 resolved murders. This means that only 11 percent of the 176 homicides that occurred in this region were resolved. “Since 92% of the incidents where violence was used to muzzle free expression and deprive the public of its right to receive information went unpunished, criminals are emboldened to feel that they can get away with murder, literally,” a press release from UNESCO said. The UNESCO report also accounts for an increase in the number of murders of digital journalists, as well as those of women. However, men continue to be the main targets. In the case of Latin America and the Caribbean, the region ranked third among those with the highest number of murders in the last decade with a figure of 176. However, in the analysis of 2014 and 2015, the region ranked second in both periods, with 26 and 25 murders, respectively. Brazil, Mexico, Colombia, Honduras and Guatemala were the countries that registered murders in 2015. Two countries in the region, Mexico and Brazil, appeared on the Global Impunity Index, a list of the countries with greatest impunity in crimes against journalists that was created by the Committee to Protect Journalists to mark the International Day to End Impunity. “The violence that criminal groups and local officials perpetrated against journalists allowed impunity to worsen in Latin America, where Brazil and Mexico climbed two places in the index this year,” said Carlos Lauría, senior program coordinator for the Americas at CPJ, to the Knight Center on Oct. 27. To commemorate this date, UNESCO has established some events around the world. In the case of Latin America, there will be a commemoration in Bogota, Colombia of the 30th anniversary of the death of Guillermo Cano Isaza, director of newspaper El Espectador who was killed on Dec. 17, 1986 by the country’s mafia. Although the murder of Cano Isaza was declared by the country's authorities as a crime against humanity, which prevents the case from prescribing (ie. there is not a set period of time by which the authorities must investigate and prosecute those responsible), it is still unpunished. The event, to be held in the Plaza de Bolivar in Bogota – one of the most important in the city – will also recall the 153 stories of journalists killed in Colombia in the last 40 years. There will also be a discussion of the life and work of Cano Isaza. Captura de pantalla de la campaña “Mis asesinos siguen libres” de la Unesco. The Foundation for Press Freedom (FLIP for its acronym in Spanish), one of the organizations that organizes this event, took the opportunity to recall that in Colombia, 97 percent of the murders of journalists remain in impunity and that 73 cases have already prescribed, meaning they will forever be unpunished. 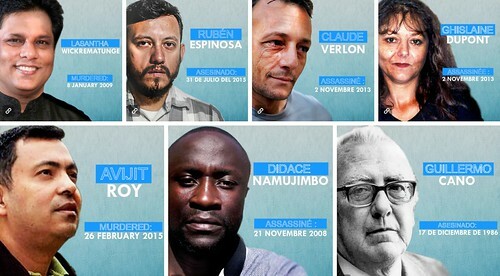 In addition to the events around the world, UNESCO also presented the campaign “My killers are still free,” to raise awareness of the high level of journalists’ killings and the prevailing impunity for crimes committed against them.” It also presents the principle findings of the 2016 Report. Two of the journalists chosen for the campaign are colombian Guillermo Cano Isaza and Mexican photojournalist Rubén Espinosa who was killed in August 2015. Another organization joining in the commemoration of the event is IFEX. Through its campaign, “No to impunity,” the organization published a special interactive “Stories in the fight against impunity” which seeks to generate awareness of three emblematic cases of impunity. One of these is of Colombian journalist Jineth Bedoya who was kidnapped, tortured and raped in 2000 while conducting a journalistic investigation. Although three of her perpetrators have been brought to justice, the masterminds of the crime remain at-large. For its part, the Special Rapporteur for Freedom of Expression of the Inter-American Commission on Human Rights (IACHR) took the time to draw attention to the high number of murders of journalists in the Americas, as well as crimes that remain in impunity. It also urged States to take preventative and protective actions for journalists, but especially to carry out “diligent, impartial and effective” investigations into all crimes against journalists. “Governments, civil society, the media, and everyone concerned with upholding the rule of law are being asked to join in the global efforts to end impunity,” UNESCO said. Hashtags like #NoToImpunity, #ENDImpunity and #JournoSafe are being promoted as part of the event.